Uh oh - are smartwatches causing tension between Google and Samsung? 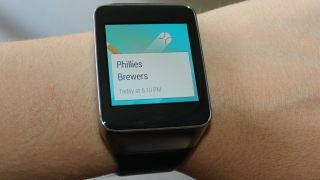 Samsung dabbled in Android Wear for the Gear Live, but was it just a friendly gesture? What's the future of the smartwatch? Even Google and Samsung aren't in agreement, with a report that the two tech giants have come to loggerheads over their differing opinions on wearables. At last week's Allen & Co. conference, The Information claims a "tense private meeting" took place where Google's Larry Page told Samsung vice chairman Jay Lee that he was frustrated by Samsung's investment in running its very own Tizen on smartwatches instead of Google's Android Wear. Samsung recently introduced the Gear Live, its first and only smartwatch to run Android Wear, but it's opted for Tizen OS on the Gear 2, Gear 2 Neo and Gear Fit and will potentially continue to do so for the foreseeable future. Given that Samsung phones account for nearly two thirds of all Android handsets sold, Google probably doesn't have as much leverage here as it would like. And with Samsung's Tizen programme steadily growing, we can't see the Korean company ditching its homemade OS in favour of Android any time soon.